Heart disease is the narrowing of the arteries over time, due to a build-up of plaque that can in some cases cause a complete blockage of the blood vessels or coronary arteries, and it’s the number one killer of women, taking 1 out of 3 women’s lives each year. 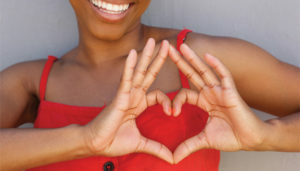 With so much focus on other diseases that affect women, like breast cancer and autoimmune disorders, heart disease is often overlooked and underestimated. One woman dies every minute of cardiovascular disease. According to the American Heart Association, “Heart disease risk rises for everyone as they age, but for women symptoms can become more evident after the onset of menopause. Both Men and Women can be treated successfully if heart disease is caught early. Usually keeping weight down with a healthy diet, keeping the heart muscle strong and oxygen-rich blood flowing through cardiovascular exercise are helpful, along with medications like ACE inhibitors, alpha-beta blockers, and cholesterol-lipid lowering drugs. In certain situations, stents, angioplasty, bypass grafts, and other procedures may be necessary. If you believe you are having a heart attack or stroke, call 911! If you’re having initial symptoms that come and go, contact your physician immediately. Your Best You’s goal is to assist every patient in achieving and maintaining their best state of health possible by providing compassionate, collaborative, and comprehensive care so that every person leaves better than they arrived. Your Best You, P.A., is a primary care and diabetes specialty practice focused on delivering unique and personalized health management services to the community. Primary care, diabetes care, and chronic disease management are their specialties. Their patients are appreciated as the expert of their life story, and Your Best You aims to assist with health-related goal setting to the best of their capacity. Their team designs treatment, management, and education plans that are based on the most current standard of care to optimize the potential and goal attainment for every patient. To make an appointment, please call Your Best You today at (813) 936-2609. 1. Barrett-Connor E, PubMed, “Hormones and heart disease in women: the timing hypothesis.” Division of Epidemiology, Department of Family and Preventive Medicine, School of Medicine, University of California, San Diego, CA, USA.,Am J Epidemiol. 2007 Sep 1;166(5):506-10. 2. American Heart Association. “Menopause and Heart Disease.” Heart.org 2015, Dallas, TX. 3. American Heart Association. Coronary Microvascular Disease: “What is Coronary Microvascular Disease (MVD)?” heart.org 2019, Dallas, Tx.